“I first saw painted wolves many years ago as student, backpacking in South Africa, and I confess I was bemused when my travelling companion, a zoologist in training, was euphoric after the sighting. ‘But they look so mangy’ I recall saying ‘like feral dogs you’d find scavenging in big cities’. And we moved on to look for some Big Five ticks instead. Sadly this widely held perception has contributed to their endangered status. Conservationists have in recent years tried to move away from the mostly commonly used term of Wild Dog, rebranding with the more engaging moniker ‘painted wolves’, and are having some success in changing attitudes towards these highly intelligent and sociable pack animals. 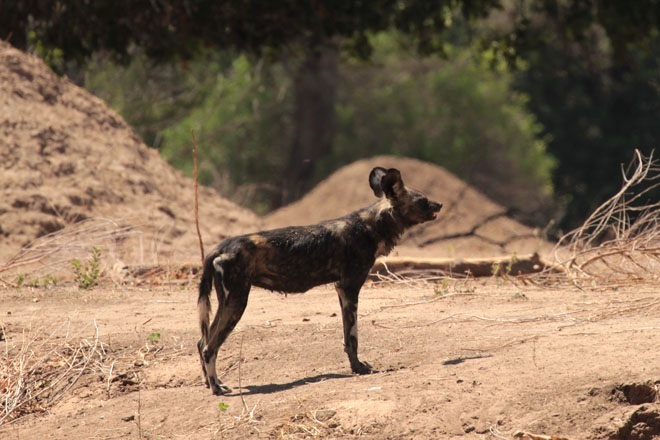 Certainly in Zimbabwe there is now national pride in the fact that the painted wolf population is slowly growing there.However farmers continue to treat painted wolves as vermin, shooting, setting snares and poisoning them, and even eradicating entire dens of young pups in defence of their livestock. Rabies, contracted from domestic dogs, has also devastated some populations due to the highly social nature of painted wolf packs. Two years ago, and somewhat better educated, I was lucky enough to find myself in the midst of a painted wolf hunt whilst on safari in Zambia. The pack exploded into a clearing where my guide and I had been peacefully watching a Malachite kingfisher fishing for his breakfast. The wolves’ formidable teamwork quickly had a hapless waterbuck cornered, only for it to be snatched from their jaws by a submerged croc, leaving the wolves fuming. This time I was thrilled to see these incredible animals almost within touching distance of our vehicle. However this exhilarating sighting didn’t even come close to my most recent painted wolf encounters last month in Zimbabwe. A number of African national parks can now boast excellent game concentrations, however their dry-season landscape - the optimum time for game viewing - is often an uninviting parched dusty brown. In Mana Pools National Park in the far north of Zimbabwe, the scenery is every bit as breath-taking as the wildlife. On our new walking safari here we walk around 10km each day, from camp to camp along the lush shoreline of the Zambezi River, encountering wildlife large and small along the way. There are only 6,500 painted wolves left in the world, and of these around two hundred live in Mana Pools National Park. Three packs claim the Zambezi River floodplain area of Mana Pools as their territory: the Vundu Pack, the Nyakasanga Pack and the Nyamatusi Pack, each ruled by a related Alpha female. We were on our second day of walking, in strict formation behind our expert and highly entertaining guide when his hand went up. Stop. My untrained eyes couldn’t make out anything but as we drew closer even I could spot big round ears swivelling on alert, exposed above a shady hollow. The Nyakasanga painted wolf pack - and Blacktip herself. Hearts racing we inched slowly forward until our walking group was only 20 paces or so from the trees that the 17-strong pack were resting beneath. The adults wolves briefly vocalised but in a half-hearted manner and soon settled back down to snoozing the day away. The pack looked calm and content, the cute pups tussling a little and earning them a cuff or two from the bigger animals. What a privilege to have front row sun-baked seats to watch the real life stars of the Attenborough Dynasties ‘show’. The next day we almost stumbled on the same pack en route to our camp, so well concealed were they in the side of a gully. This time the sentinels got to their feet and gave us a few warning barks to say ‘we’re here’ before settling. Carefully retreating we gave them plenty of space, before eventually circling round to the far side of the dry river channel where we were again able to sit and watch Blacktip directing her pack as they moved between trees. Unreal. Whilst I can’t claim the three years of committed filming that the BBC Dynasties crew put in, after hanging out with the Blacktip and her painted wolf family on two consecutive days I was completely captivated. There is something unique about encountering wild animals on foot. Although my closest sightings of painted wolves have been from a vehicle, stepping into their world, walking on their level is an entirely different and utterly exhilarating experience.Even though painted wolves are Africa’s most successful predators, more efficient than both lion and leopard, there is apparently no record of a painted wolf ever attacking a human. And certainly under the watchful gaze of our vigilant guide I felt I could relax and enjoy these extraordinarily joyful moments, now indelibly printed on my memory. If you would like your own close up encounter with painted wolves and other amazing wildlife, take a look at our new Mana Pools & Lake Karibe Walking Safari, and take a walk on the wild side.